The completed product. We will leave the finished ‘brushed’ although we could just as easily polish it or paint it the color of the body. This project encompasses all the skills needed to fabricate much larger pieces. We will cut, bend, stretch, shrink and weld this small item. That is everything that can be done to a piece of sheet metal whether forming a small patch panel or a complete car. The Devin was one of many sports cars being manufactured in the fifties. This particular car lacks a windshield and the owner wants a small but functional windscreen to make driving the car less an act of self-punishment. Try taking a small stone or insect to the face at 60MPH to see what we’re talking about. 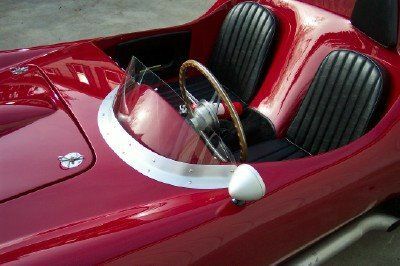 The actual shape of the windshield must foremost be aesthetically pleasing while providing protection for the driver. Since I will use the cowl of the car as a ‘buck’, the first step was to protect the area I would be working on with masking tape and cloth fender covers. Consulting photographs of similar vintage sports cars reveals that the windshield frame will be about 1 ½ inches tall, I’ll make the portion that attaches to the cowl the same dimension. So I need to cut a strip of aluminum a bit wider that 3 inches and long enough to reach all the way around the instrument cluster pod. I measure this to be about 34 inches. We are using .063 thick material; this gives plenty to work with when it comes time to remove the tool marks. With the strip cut and de-burred the next step is bending it the long way which basically gives us the ‘rake’ of the windscreen itself. This is a straight forward bend on the brake which I just kind of do by eye. Now it’s time to shape the frame to match the curve of the instrument cluster pod. I’ve marked the masking tape with the smooth, sweeping curve I want to accomplish. I have to stretch the bottom flange I order to bring the ends around. This is done with the help of our stretcher (yes, the name is obvious). The jaws of this machine actually spread the metal apart a small amount each time pressure is applied to the handle. Another machine does the opposite; gathering up and thereby shrinking the material. But the effect of stretching the bottom flange is to push the ends of the frame down. The thing that’s needed is some shrinking to bring the ends of the frame back into alignment with the marks. The thing to be aware of is that performing an operation on the work piece will cause a reaction somewhere else. So generally it’s a matter of a little back and forth to get the metal to go where it’s wanted. Once the basic shape of the frame is complete I mocked-up the windscreen with a piece of cardboard. This will become the pattern for cutting the windscreen material later on so I made it oversize. We are ready now for the owner of the car to look things over, sit in the driver’s seat and make adjustments based on personal preference. We decide on the contours and a finished height just below eye level. I said earlier that this project includes all the operations one can perform on a piece of sheet metal. ‘Where is the welding?’ you ask. Well, the customer wanted the left side of the frame to sweep farther back on the cowl than I had allowed for. So…I have to add to the frame, a small amount of welding but welding none the less. The frame gets more fitting and adjusting to get it to lay flat against the cowl. Then some pick and file work to make it pretty followed with sanding to remove the tool marks left by the shrink/stretch and filing operations. The holes to mount the frame are drilled into the cowl. The windscreen itself will be made of 1/8 inch clear polycarbonate (Lexan). This is very tough material that can be cut and drilled with ordinary tooling. After tracing the pattern onto the Lexan the piece is cut-out a little oversize on the bandsaw. This material shapes nicely with files and sandpaper so that is how the edges get cleaned up. Next, I measure and drill the mounting holes. We’ll use slotted screws because this type of fastener was prevalent in the fifties.